The 7 Places You Must See In Central America! 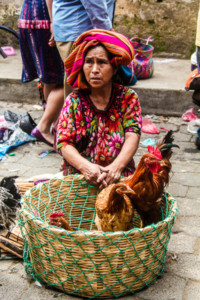 Central America is a land of rice, beans, chicken buses and backpackers. We spent 6 months meandering our way from Panama to Belize and everywhere in between. We enjoyed almost every minute and wanted to share with you our 7 must see spots from our trip! Living in this pulsating heart of offshore bank accounts for 3 months felt like I was back in Australia. It’s a thriving metropolis with huge sky scrapers, big malls, great bars, big clubs and any food you could possibly want. If you’re hoping for a third world beach-hopping get away, this might sound terrible. 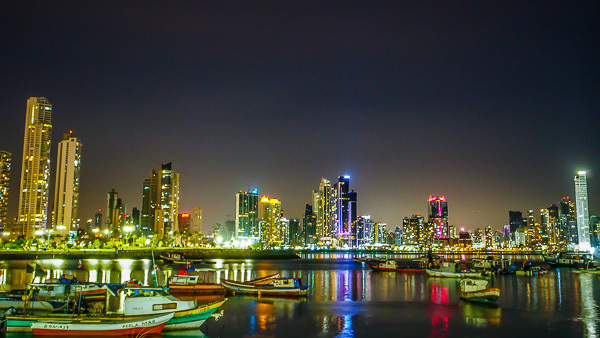 But, if you’ve just spent months traveling through South or Central America, Panama City is heaven. Essentially, you’re able to restock on normality before hitting the trail again. The best hostel to stay in town is Luna’s Castle. The metropolis that is Panama City. If you want an eco-lodge retreat for hostel prices, then Lost & Found is the place for you. 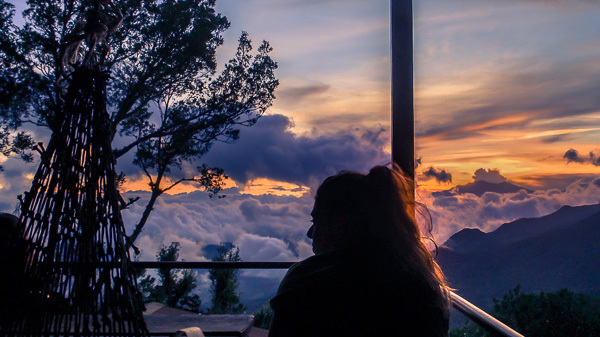 This hostel is literally in a cloud forest on top of a mountain. It’s located halfway between Panama City and Bocas del Toro. To get there, you’ll be dropped off on the side of the road, seemingly in the middle of nowhere. You’ll then follow a hiking trail uphill for 30 minutes. Right when you want to throw your bag back down the hill, you’ll see the hostel. The view from the common area is breathtaking and all this at cheap-as-chips prices. The view from Lost & Found’s common room. Amazing. 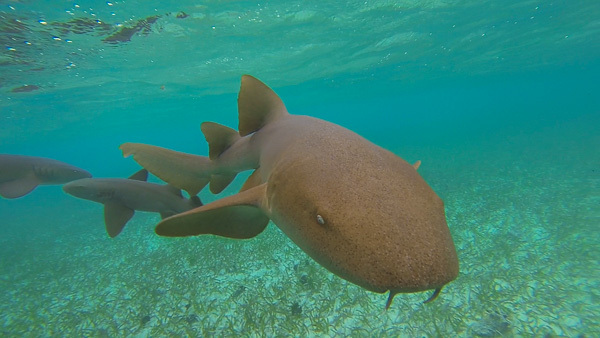 It’s a small island off the coast of Belize where you can scuba dive, party and swim with sharks if you’re game. It’s also the launching point to Belize’s famous Blue Hole, but that’s quite expensive (around $400 US). We just found it to be a great place to sit back, relax and stare into the crystal-clear Caribbean water. Having Central America’s best beer, Belikin dark, was a big bonus. One of the strangest and best things about Caye Caulker, though, is that you don’t even feel like you’re in Central America anymore. The English-speaking, weed-smoking rastas on the island give a great vibe that you won’t find anywhere else. The best hostel to stay in town is Bella’s Backpackers. This ridiculous place is one of the best hostels we’ve been to. 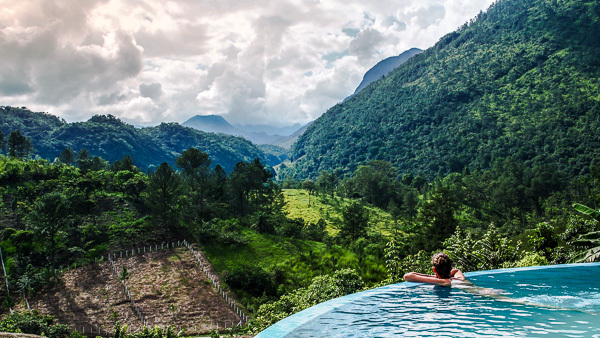 It’s in the town of Lanquin, just 30 minutes away from the beautiful Semuc Champey. This makes it a mekka for backpackers on the Central American gringo trail and for good reason. They’ve even given you a view when you’re on the toilet or in the shower! Get in quick, though, as they will surely start pricing out the cheap backpackers and going for a more high-end market. This island is just a few hours off the northern coast and is home to some of the best scuba diving in the world. The island offers 100 different dive spots to choose from and just as many different dive shops. I dove with Underwater Vision for a rescue diving course. They had great instructors, bargained with me and even threw in some free accommodation for Mariana! 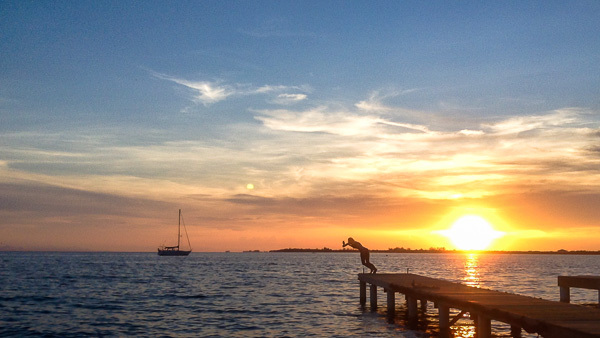 However, Utila is also known as the biggest party island in Central America. Some people can stay here for months on end and not even step foot in a dive center, unless it has a bar. Tequila Tuesday almost killed me, but I got the singlet, so it’s okay. If you want the scuba but not as much party party, Roatan next door is a good laid back option. It even has an international airport with direct flights to the US and Europe. The best country in Central America, hands down. We loved our time here and wished we could have spent longer. There is so much to do, from visiting genuine indigenous communities to doing outdoor adventure activities. Even just getting around is an experience with their crazy and cheap chicken buses. Fuego volcano: hike up nearby Acatenango volcano and see this beast spewing lava throughout the night! Related post: Have you ever seen a drunken horse race before? Traveling slowly, you could easily spend 3 months here. Add a few months if you want to do any volunteering at the many, many options available throughout the country. “The what islands?” I hear you say. 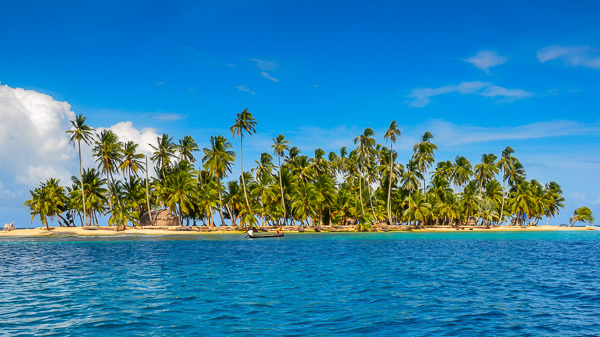 The Guna Yala or San Blas Islands is an archipelago of islands in the Caribbean between Panama and Colombia. Just picture 365 paradisiacal islands of which only 50 are inhabited. They range from the size of a few hundred meters in diameter to just a few meters. Most are only the size of a football pitch with a couple dozen palm trees and a few hammocks strung up between them. The islands are a semi-autonomous region, which means they have their own government and local laws. One of the laws that the chiefs (called Sahilas) enforce is that no foreigners are allowed to set up hotels or resorts. This means that there are next to no tourists! The only tourists you’ll see are the ones using the islands as a stopping ground for the journey between Panama and Colombia (as there is no road through the Darien Gap). Other than that, all you get is genuinely amazing indigenous people and palm trees. Fun fact: coconuts are still used as currency on the islands! How could you beat sleeping on an island like this? 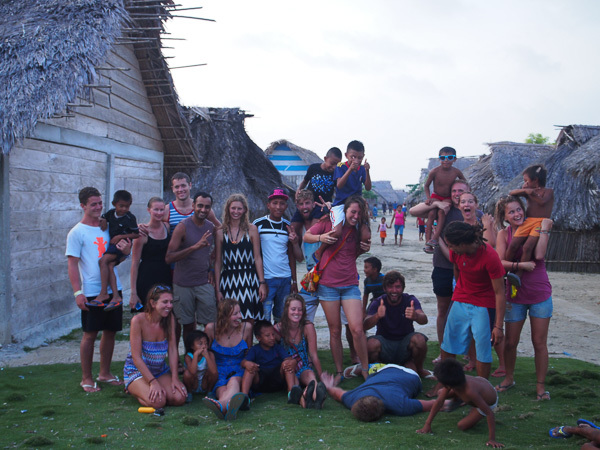 I spent 3 months here working as a tour guide for San Blas Adventures and can’t tell you how amazing this place is. 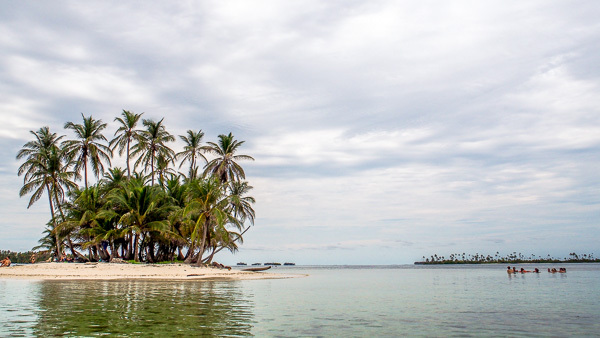 If lazying on deserted islands sipping coco locos is your thing, then you have to make the San Blas Islands your number one stop in Central America! A twenty-something x engineer who loves eating strange things, jumping off things, can be a little OCD about most things and loves trying to make his travels as cheap as possible! I’ve been to all of these that aren’t in Panama! Seems you really liked Panama though! I’ll have to pop back I guess! Panama is definitely an underrated country in Central America.I spent a total of 4 months in Panama and i can happily say i enjoyed almost all of my time there. It’s a very under rated country and it’s great to see you’ve found its beauty! Now I´m very curious to see Panama. Unfortunately, I never made it there. It’s a pity that you’re not the only one. Panama is a very underrated country that everyone seems to skip when going to Central America. There is always next time for you man or you can now make it an excuse to go again! Thinking of bringing my mom…seems the ad is geared for the young…. do older American tourists go there? I assume yes…Any recommendations? Sure there are a lot of younger people there and they can get a bit rowdy (just like any place backpackers go), but it would be easy to get away from it got too much. During the day you can do lots of day trips and in the evening the property is big enough to get away from the noise (if there is any) of the bar. While we were there we met a couple in their 60’s who seemed to be having a great time. Hi there! I am a solo female backpacker 22 years old and I am wondering how you navigated your way around. I have backpacked Europe and was able to use flights, flixbus, and trains there. Are there any bus companies or trains you would recommend for central america? thanks! !